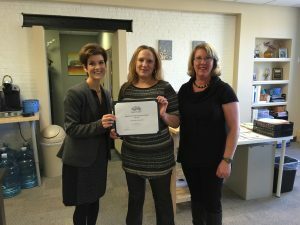 Stacey Bruzzese, President/CEO(left) and Melissa Seavey (right) present the Business of the Month Award to Angela Orben, Secretary of the Board of Directors for the Steve Lyons Fund organization. In recognition of their distinctive role and ongoing efforts to promote youth and arts in Haverhill, the Greater Haverhill Chamber of Commerce is pleased to announce the Steve Lyon’s Fund as the July 2015 Business of the Month. Founded in 2007 to honor the memory of Steven William Lyons, the organization hosts the annual “Rock Out! Cookout” at Winnekenni Castle in Haverhill. This all-day, outdoor music and arts festival has raised over $13,000 and has benefited organizations including The Sad Cafe, Massachusetts Special Olympics, Boy Scouts of America and Reid’s Ride for Cancer Research. In 2014, the Steve Lyon’s fund donated $3,000 to benefit students participating in art, music and theatre programs at Haverhill High School. The Steve Lyon’s Fund has been an active participant in the Chamber and the Downtown Haverhill Committee. Most recently the organization helped make the KidsArts FEST a great success with a day of entertainment including live music and a puppet show. Award winners are recognized in area newspapers highlighting their distinction as Business of the Month, receive a complimentary guest ticket to the Greater Haverhill Chamber of Commerce’s exclusive “Annual Business Awards Breakfast” and are automatically entered into the running for the Annual Business of the Year award. That honor is announced during the annual breakfast in February 2016.